Iraq crisis: Why aren't gas prices spiking? 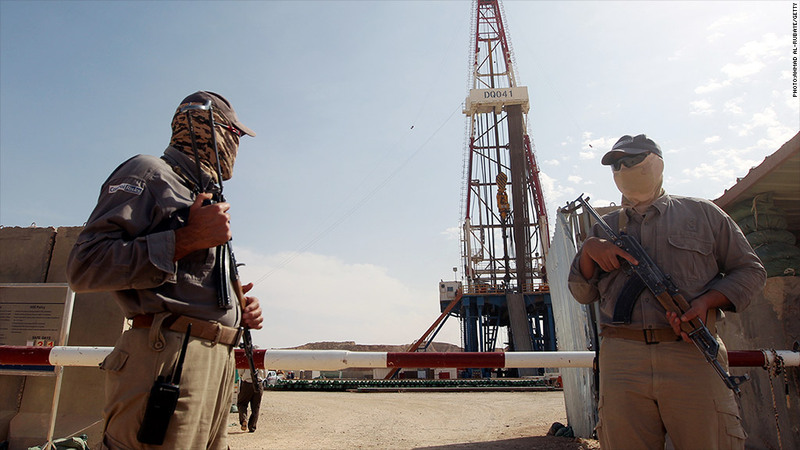 Security guards watch over an oilfield in Badra, Iraq. The drums of war are beating in Iraq, but you wouldn't know it from looking at oil prices. The average price for a gallon of gas in the U.S. is $3.48. That's cheaper than it was a year ago, according to AAA. On the global market, the price of crude oil is still trading under $100 per barrel. It's a notable phenomenon considering that the United States is engaged in an open-ended bombing campaign against extremist militants in an oil producing country. For starters, it has to do with the geography of the violence, according to Tom Kloza, chief oil analyst at GasBuddy.com. Kloza explains that most Iraqi oil comes from the Baghdad and areas in the south of the country, which so far haven't come under attack from combatants from the Islamic State of Iraq and Syria (ISIS). Rather, most of the fighting has occurred in the north near Mosul, the second largest city in Iraq, and Irbil, the Kurdish regional capital. The affected region contributes about 15% of Iraq's oil production. Oil spiked to over $107 per barrel in June when ISIS first began taking over wide swaths Iraq, but Kloza says oil traders now "aren't buying on the premise that this could spread to southern Iraq." The U.S. airstrikes have also calmed jitters by containing the ISIS threat, asserts Phil Flynn, an energy analyst with the Price Futures Group. "They're not going to be able to compromise oil supplies while they're dodging bombs left and right," Flynn says. There's also the global context. Iraq isn't as critical to global production as it once was. Flynn claims that the crisis in Iraq lead to a ramp up in oil production last month, which flooded the market with even more oil than there would have been to begin with if not for the turmoil. But the biggest game changer in keeping energy prices low is an increase in oil production in the U.S.
America produced a little more than 13.6 million barrels of oil per day in the second quarter of this year, up 50% from the same period in 2009, according to data from the U.S. Energy Information Administration. That's helped provide a nice cushion for oil prices in the face of geopolitical tension in Iraq and beyond. Oil prices were under pressure after the sanctions against Iran and the sharp decline in oil exports from Libya after the fall of dictator Moammar Gadhafi in 2011. .
And while Kloza considers oil "well valued" at the moment, he feels that the boom in domestic production could be an even bigger game changer. "If not for all of this violence and the total loss of Libya, we'd be looking at a lower price," Kloza says.